Zarafa Camp evokes a sense of old-style safari, with spacious tents positioned under shady trees with breathtaking vistas of the Zibidianja lagoon. The main area is furnished in a ‘campaign’ style, where tents evoke the traditional safari ambiance of the turn of the last century. 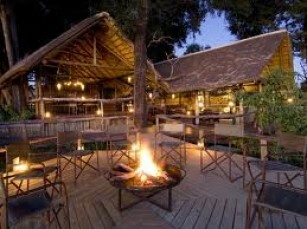 Lounge and dining facilities may be enjoyed under canvas or on the full-length deck shaded by giant broad-leafed trees. Accommodation consists of four large, luxuriously appointed double or twin ‘marquis style’ tents with verandahs, positioned under cool and shady trees overlooking the Zibidianja Lagoon. Hosting a maximum of eight guests, it’s perfect for those who favour a more intimate experience or for exclusive use. A large bedroom, en-suite bathroom featuring a copper bath and both indoor and outdoor showers, are standard. Activities are flexible but include morning, afternoon and night game drives with experienced professional guides in custom-built 4×4 Toyota Land Cruisers. Short guided nature walks from camp are encouraged, to introduce guests to some of Africa’s less prominent wildlife. 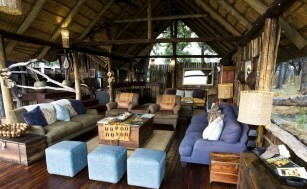 The camp boasts all of the Chobe wildlife, with a varied bird and mammal community. Abundant plains game can be found here including lechwe, kudu, buffalo, zebra and giraffe. It is also a predator-rich reserve including cheetah, wild dog, lion, and leopard. The massive herds of elephant are another highlight while a wide variety of birds – some 300 or more – can be seen. Zarafa Camp is owned by Dereck and Beverly Joubert – award-winning filmmakers at National Geographic for over 25 years who have spent much time filming in and around the Selinda Spillway. 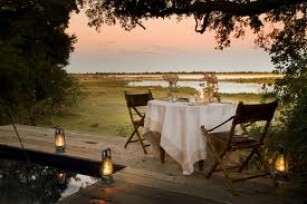 Duba Plains Camp is perhaps the Okavango Delta’s most remote camp. It is located in the furthermost region of the Delta, an area renowned for endless conflict between prides of lion and herds of buffalo which sustain the plains. The award winning National Geographic documentary Relentless Enemies chronicles this battle for survival on this private 30,000 hectare reserve. 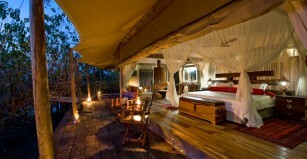 Duba Plains Camp is a small, intimate camp, situated on an island surrounded by expansive, seasonally flooded plains and shaded by tall ebony, sycamore fig and mangosteen trees. Accommodation consists of six spacious tents with en-suite bathrooms, outside showers and verandas with panoramic vistas of the Okavango Delta floodplains. The thatched lounge, dining and bar areas are raised along with the pool on wooden platforms to better appreciate the breathtaking views. The camp offers a variety of activities, ranging from mokoro (wooden dug out canoes) and boating excursions (water levels permitting) to day and night game drives in open 4 X 4 vehicles, and walking safaris. Your luxury African safari starts by tracking down one of the enormous buffalo herds to see whether the lions are on the prowl. The lion numbers here are probably one of the highest in the world. Thousands of buffalo take advantage of Duba’s rich grasslands and they support the concentration of lions and hyenas which prey on them. These huge buffalo herds are hunted almost daily by up to four different prides of lions that live in and around Duba. 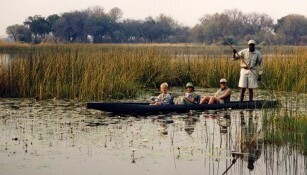 The Okavango Delta is as close as you can get to Eden. Herds of elephant feed on the islands and hippo wade out into the deeper channels. Tsessebe and blue wildebeest dot the plains, while red letchwe are found on the fringe of the wetter floodplains. Bird life is abundant with often sighted rosy-throated longclaw, slaty egret and wattled crane.